Lameness is one of the most common health concerns in horses, but new technology that connects animals to a computer may identify problems sooner. Veterinarians have typically conducted a clinical form of evaluation to assess lameness, but some forms can be quite subtle, said Heidi Banse, an associate professor at the University of Calgary’s veterinary school who specializes in equine medicine. The lameness location unit, which was invented about 10 years ago, can provide a fast and accurate diagnosis. Horses are typically graded on a scale of zero to five with the lowest number meaning they are sound and five indicating non-weight bearing lame. Veterinarians can watch head nodding for front lameness and hip swaying for back foot trouble, but often a visual appraisal does not pin point the trouble spot. “Where people find it really useful is where horses have multiple limb lamenesses,” she said during a demonstration at the vet school’s open house Oct. 4. Sensors are placed on the horse’s head to measure vertical motion as well as on the pelvis and one of the right front pasterns. While wearing the sensors, the horse is made to trot around an area to determine where pain might be found. The sensors send a wireless signal back to the computer, on which a series of graphs and indexes appear for each leg and foot. 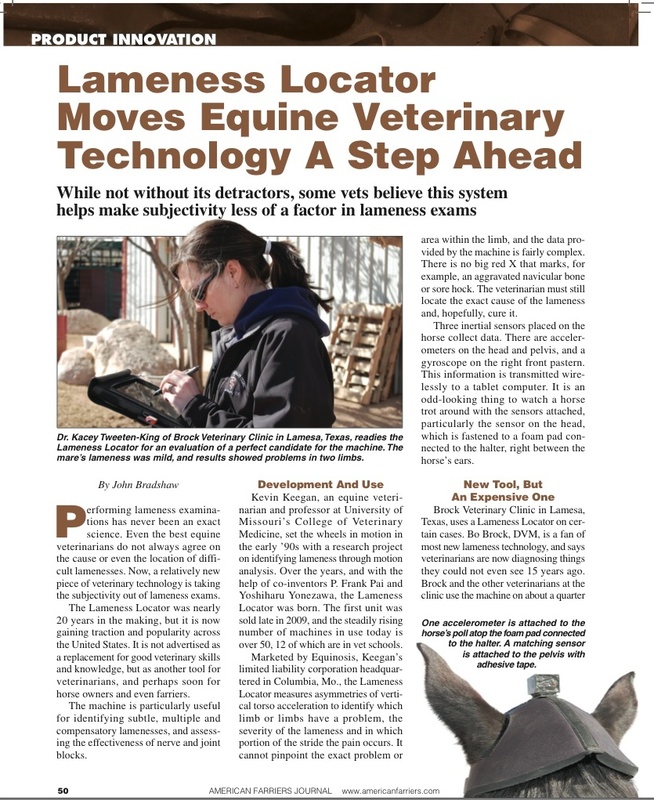 Learn more about this topic by clicking on the above image and reading "Lameness Locator Moves Equine Veterinary Technology A Step Ahead"
from the April 2011 issue of American Farriers Journal.